Bjarke Ingels has spoken of his desire to replace Modernism's "boring box" legacy with new kinds of localised architecture at a lecture at New York's Metropolitan Museum of Art (+ transcript). "What we've been interested in is in a way not to return to the vernacular, but what you can call 'Vernacular 2.0'," said the architect, who is founder of Danish architecture firm BIG. Ingels was speaking at the first in a series of lectures by influential architects, organised earlier this month by the Met's architecture curator Beatrice Galilee. Dezeen is media partner for the lectures. Ingels said he wanted to break away from the identikit architecture created by the combined forces of Modernism and climate-control systems. "The International Style of Modernism came with the advent of building services. In the end, the architecture became like a container space, essentially like a boring box with a basement full of machinery to make it inhabitable," he said. "As a result, buildings literally started to look identical all over the planet." This global style failed to offer people choice and is forcing residents to adapt their lifestyles to the buildings, he said, adding that architects were finally realising people around the world want to live in different ways, requiring different styles of architecture that could be localised and responsive to different environments. And he said that new technologies would enable architects to take back control of this design process. "Today we have sophisticated building technology, we can calculate and simulate the environments and performance of the building, the thermal exposure of envelop, or the air flow through an urban space or structure." "Rather than 'Architecture without Architects', it actually allows us to do 'Engineering without Engines'," he explained. "We can engineer a building and design a building with least reliance on active machinery to make it inhabitable." Ingels' firm has designed a wide range of unique buildings, with current projects including VIA – also known as West 57th – a New York housing development with a rectangular plan pulled up at one corner to form a triangular tower; a series of storm defence initiatives for Manhattan; the Amager Bakke Waste-to-Energy Plant with a ski-slope on its roof and a smoke-ring-blowing chimney; and a snail-shaped house for a car collector in Denmark. The architect was the first participant in the In Our Time lecture series, a new venture from the Met. The series, which focuses on contemporary work by architects who "will be remembered in the future as being part of our time", is organised by Galilee, who is the museum's Daniel Brodsky associate curator of architecture and design. Among the upcoming speakers are Japanese architect Kazuyo Sejima and Chile-based duo Pezo von Ellrichshausen. Ingels' lecture was followed by a Q&A with Galilee, during which he described himself as having "drunk the Kool-Aid" for being a fan of Google – for which he is building a new headquarters in Mountain View, California, with British designer Thomas Heatherwick. Bjarke Ingels at the Metropolitan Museum of Art. 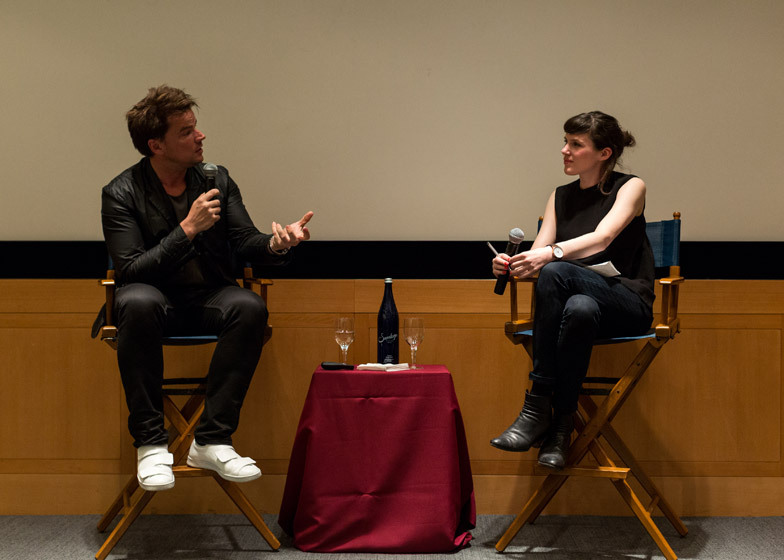 Top image: Bjarke Ingels in conversation with Beatrice Galilee. Photography is by Fran Parente. Beatrice Galilee: You are pretty young for an architect – 40 years old. When we first met, which was quite a few years ago, we talked about your career starting at a time where Frank Gehry was becoming an icon maker, and people were becoming dot-com millionaires. Can you tell us a little bit about your early years? Bjarke Ingels: One of the dilemmas of architecture in general is that there is a Catch-22 – you can't actually get to be commissioned to do certain types of building until you've already built that type of building. So it seems to be incredibly hard to get going. We were very fascinated by this idea of dot-com billionaires being in their 20s, and we weren't looking forward to being unable to get commissions until we were deep into our 40s. So we actually tried to apply for different grants for doing IT projects and some films. In the end, we secured zero funding for all of our non-architectural attempts. We also worked on some open competitions on the side, which we actually end up winning, so it turns out to be easier to become what you trained for six years in school rather than changing professions. One thing that I really discovered since moving to America five years ago, is that Europe is a little bit stuck in the technocracy and bureaucracy of public tendering projects that I actually experience over here a much more courageous ability to think laterally, to basically say: "OK, you guys have already proven that you can think, that you can handle complex projects whether large projects or complicated situations, so even though you haven't necessarily done [a project] like a museum or a concert hall or stadium or whatever it is, we can see that you are capable of handling complex situations, and we are willing to bet on your ability to do so." We actually got the commission from the Smithsonian Institution to rethink their entire south campus master plan project for $2 billion, at the point where we had not even completed the Danish Maritime Museum yet. They are basically entrusting us with the crown jewels of American subculture and history, having not really built the museum yet, which I think is a uniquely American way. This is almost unimaginable in Europe. Beatrice Galilee: How much do you think your success is to do with also the way you talk about your work – your ability to talk about architecture in a way that is very persuasive and compelling? Bjarke Ingels: One of the conditions of architecture is that a building has to be able to live in its own right. A building shouldn't rely on having somebody speak on its behalf. It should speak for itself. But the problem is that it is always judged before it is built. Other art forms can somehow be materialised, a painter can actually paint a painting and you can judge the artwork from being done. In architecture, building is so expensive and relies on so many permits, so many different decision makers need to make decisions around it, so that in order for a building to be able to prove its worth as an artwork or as environment, you already have to get past like a thousand nos. For a painter, it's a canvas, a brush and a paint, that is his or her materials. For the architects, it is our capacity to listen to the concerns and demands of the users and the clients, and then to communicate our ideas to the clients, to the public officials, to the craftsmen going to build it – because if you can't transmit your ideas, they will never get materialised. For architects, our ability to communicate ideas and transmit ideas is almost like our paint and brush. Beatrice Galilee: How does that work when you work with, for example, technology? Architecture is slow, and you are dealing with Google, who are much more nimble – they are already 10 years ahead. How do you catch up with technology as an architect? Bjarke Ingels: I think quite often you ask a lot of architects, to try to combine available materials and available technologies in interesting ways to create new qualities. But I think in the case of Google, it is a company where their entire business model is that they are used to actually sinking a lot of resources into non-recoverable engineering, and then eventually, once they actually hit the gold, then they can actually replicate that infinitely and it can become valuable. They don't want marble floors, gold leaf or solid gold, but they don't mind spending a lot of resources on trying to develop a technology or material or product that once it has been developed, you can then replicate very affordably. There is an incredible belief in the value of research and development and design. In one of our first conversations, Larry Page was talking about some kind of system that could pick up people's cars and deliver them. It sounded like he was referring to an existing system, and I asked if it was something that is available in the industry that we could look into. He said "we did a little bit of research, and it is not something really out there, but it is not something that $50 million can't solve." We haven't seen that amount of resource yet, but at least there is this idea that it is really worth it and valuable to spend a lot of energy trying to develop something that isn't yet available. Beatrice Galilee: Your Google campus project has been described as the Truman Show. How do you feel about that? Potentially with Google, you are kind of absorbing a brand identity that some people regard as slightly terrifying in terms of controlling, absorbing information and so on. You are creating a work environment that is potentially politically a bit scary. Bjarke Ingels: I think Google is an incredible company, it has an incredible company structure. The reason that they are now being seen as this thing to be suspicious about is because of the incredible success of what they are giving away basically for free, right? Because it is so incredibly accessible, of course they become our window to a major part of our research, our knowledge, etc. So I think it is like a non-criticism – because of their awesomeness that they cause people to be suspicious. The project we are making for them is so incredibly generous to the neighbourhood that they are part of. They have created bus lines that allow them to take cars off the highway, off the public system, by picking up their own workers and facilitating the commute with a free communal, collective transportation system – that's awesome! But because the people of Google like to live closer to where the bus lines are, it is driving up the real estate value, and suddenly they are encountering people that throw stones at the buses, because it seems like they're accelerating gentrification, but actually it is a great thing that they are doing. We just want to try to continue this incredible citizenship that they actually show by contributing to the resilience of Mountain View with landscaping, by actually making the building really inviting and open, people can literally pass through them. In fact, I couldn't think of a more generous company... I feel like I drank the Kool-Aid. Beatrice Galilee: Ok, I will just end with an In Our Time themed question. How do you think that people want to live now? Bjarke Ingels: I think the answer is that people are different, and therefore housing should also be different. You want to somehow contribute as many different qualities as possible. I am actually shopping for an apartment right now. I'm really obsessed about the outdoor space. And I think traditionally, places like New York have been very anti-outdoor space. But I think most of the developers that we are working with are beginning to realise that there is actually something there. I think maybe the fact that New York is a much cleaner city now than it was maybe 20 years ago makes the outdoor more desirable. Modernism was based on this idea that for every problem, there is a universal solution that would be an ideal solution that could be repeated infinitely. I think today the realisation is much more that people are different, therefore the way that people want to live is incredibly different. As architects, as clients, and as developers, we have the responsibility to really try to not think about universal solutions, but actually try to take the risk and show the courage to put some diversity out there. Because once you put some choices out there, there are actually a lot of different tastes rather than this narrow real-estate-agent-driven definition of demand. People kind of require something that they can't really request. There is almost like a self-fulfilling prophecy that if you only offer a certain way to live, then of course that is going to be sold, and inhabited and rented out.